With all of its heart healthy benefits, I figured that one can never have too many salmon recipes. Nothing beats cooking a big piece of salmon in foil, either on the grill or in the oven, but these spice rubbed baked salmon recipe surpasses even that favorite recipe when it comes to preparation time. It only takes 15 minutes (18, tops) from start to finish. Not too shabby, right? It takes me longer to get out of bed in the morning after hitting the snooze button five times. Recently, my friend returned from a California vacation, loaded down with limes from her parents’ tree. Would I like some? Um, that would be a “yes”, a thousand times over. 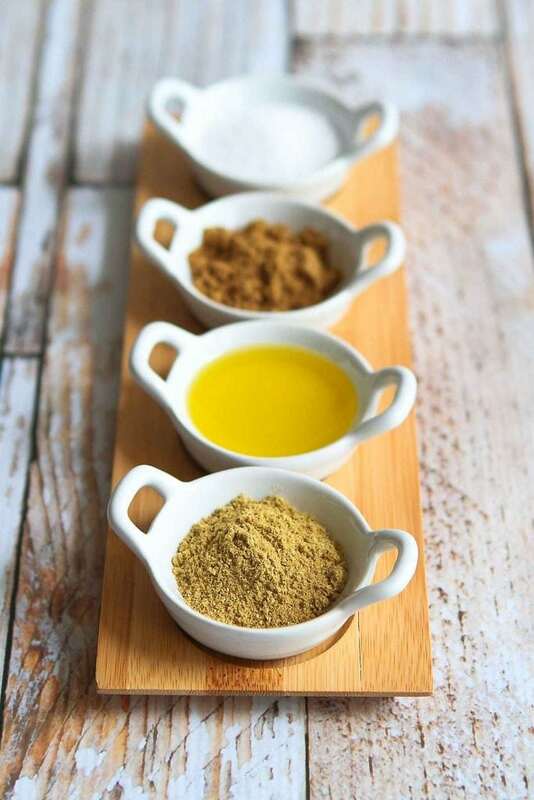 I rummaged around in my pantry and picked out a couple of spices for an easy spice mix – cumin, ground coriander and salt – that is made “baste-able” when mixed with some olive oil and agave nectar (or honey). 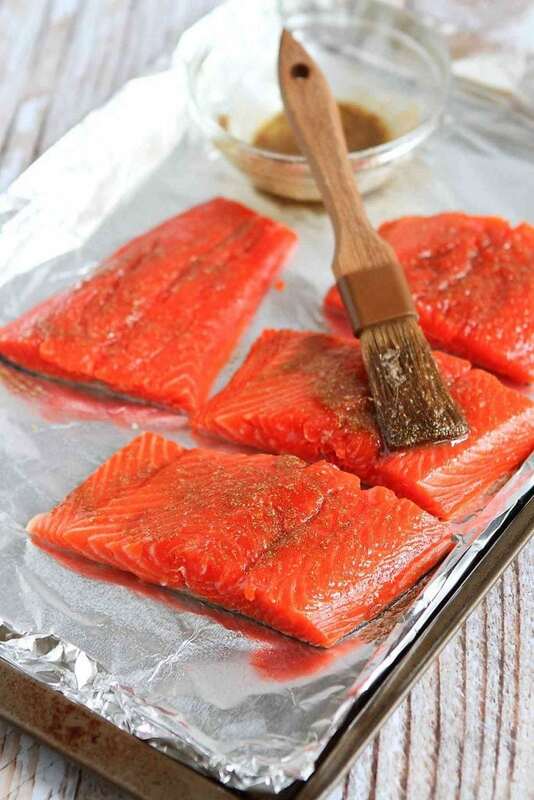 Just lay the salmon fillets on a foil-lined baking sheet that’s coated with cooking spray, slather them with the spice mixture and broil for 6 to 8 minutes. It’s that easy. And the lime? It is squeezed over the salmon right before serving. The juice adds brightness and tang to the savory sweet salmon. The flavor is unbelievably good and the salmon is tender and juicy (just be sure not to overcook it). 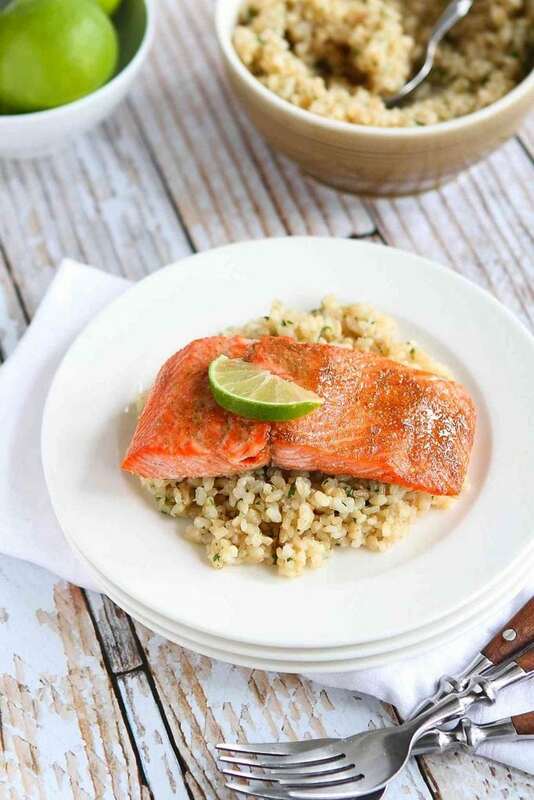 We served the salmon over cilantro lime brown rice (the recipe is coming soon) and alongside some steamed broccoli for a healthy meal that is quick enough for a busy weeknight. That being said, I wouldn’t hesitate to serve this salmon to company. It’s that good. Preheat the broiler. Set the rack 6 inches from the heat source. Line a baking sheet with foil and lightly coat with cooking spray. Place the salmon fillets on prepared baking sheet, skin side down (if the salmon isn’t skinless). In a medium bowl, stir together the olive oil, agave nectar, coriander, cumin and salt until combined. Brush the olive oil mixture over the salmon. Place under the broiler until the salmon is just cooked through, 6 to 8 minutes depending on the thickness of the salmon. Squeeze lime juice over each fillet. Serve. This recipe was originally posted on August 25, 2014, and has been updated. Honey lime really does do magical things. And yes, you must make salmon. It’s such a versatile fish! That is some gorgeous salmon! Thanks for reminding me I need to make some already! Thanks, Tieghan! I was so happy to find some wild sockeye at the market. I’m with you, Liz! Thanks, lady. I love salmon and this looks super healthy and delicious! I bet it tastes AMAZING! Thanks, Millie! The flavor really was out of this world. We’ll be making this over and over again. Making this for my family soon! So delicious! Thanks, Lori! I hope you enjoy it. Easy and healthy … perfect! Can’t wait to try! Thanks, Sommer! I love that this is so easy to pull together…and healthy, to boot. It’s a win-win! I love this dry rub! I always use my fave “rub with love” dry rubs from Tom Douglas and ran out recently so had to make my own chicken rub. . can’t wait to try this one for my salmon! delicious!! Thanks, Alice! I haven’t tried those rubs, but I’ll have to keep my eyes peeled. I love lime and salmon together! This sounds so good! Thanks, Jessica! They really are a match made in culinary heaven. oh YUM! that looks amazing! I just pinned it. 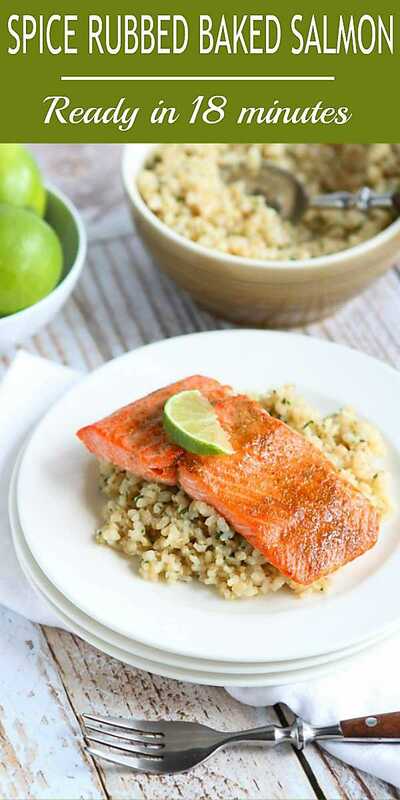 Salmon,honey, lime, cumin, coriander, agave..that’s a winning combination . I can’t wait to try it. I love lime over salmon! It makes the salmon taste so bright and fresh. I can’t wait to try it with the cumin and coriander, especially because coriander is my favorite spice! This salmon looks delicious! Love this easy and healthy. I need to make some soon! Mouthwatering recipe. One of my favorites. Thanks for posting this. 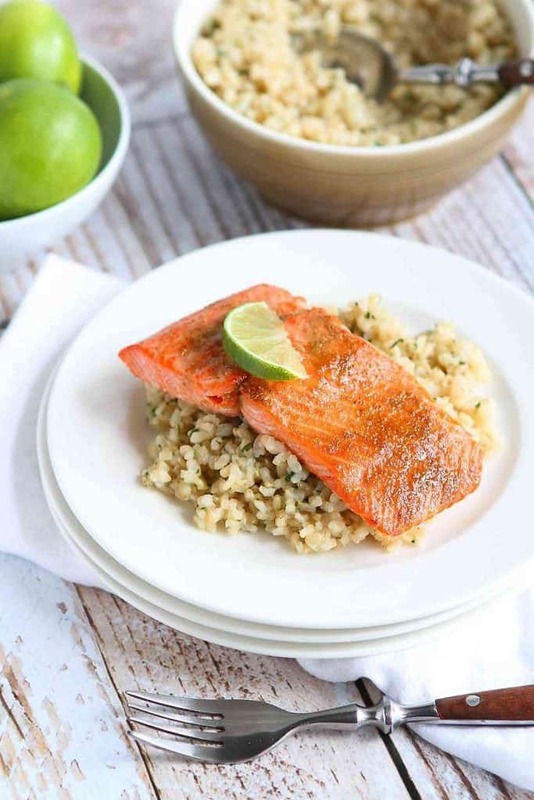 This is the recipe that convinced my kids to eat salmon. It’s a family favorite that we make at least once a month.